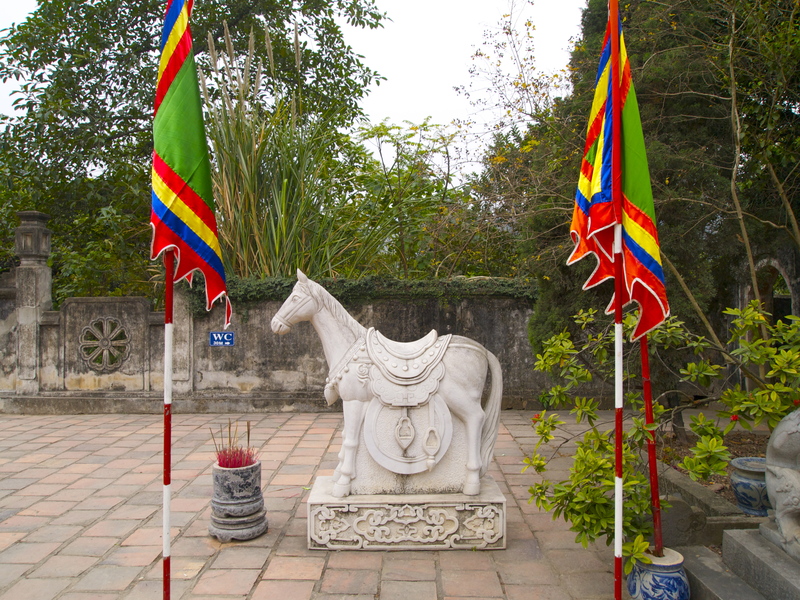 Monday, January 17: I wake up to a drearier day than any I’ve seen in Vietnam, my throat burning. 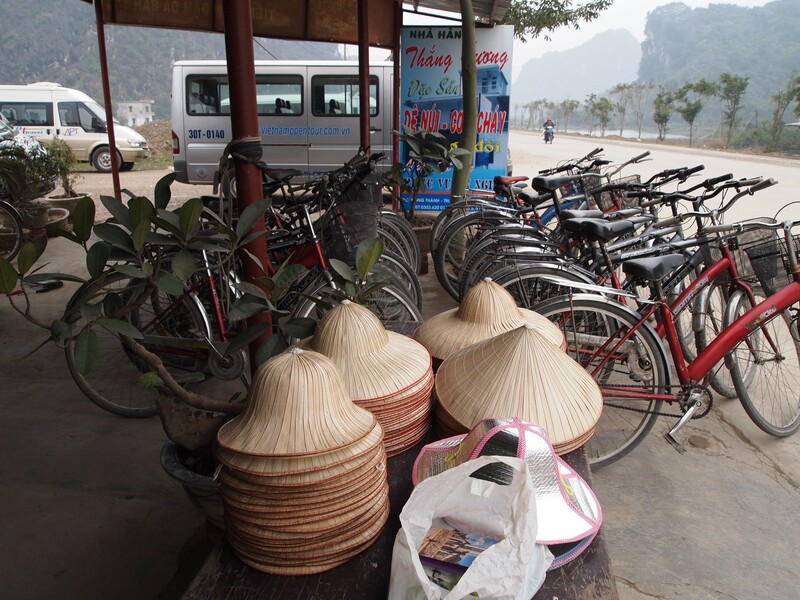 But, I’m on vacation, so I force myself out of bed and get ready for another local tour I’ve arranged, to Hoa Lu and Tam Coc, about 100 km south of Hanoi . It’s a long drive to both of these places, and in the van, I get to know the other travelers. Our guide is “Adam,” his American-version name that happens to be the same name as my own son. Most of the day, I talk to Colin and Tracy, a couple who work for the postal service in Manchester. 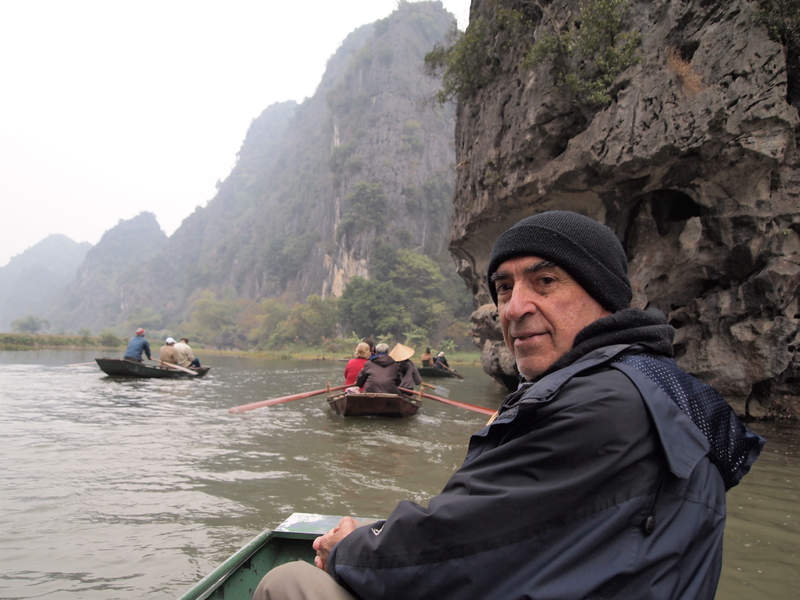 There is Joao, a quiet older guy from Lisbon, Portugal, and an entire Vietnamese-Canadian family from Toronto: mother, father, daughter, and Chinese son-in-law. Danny and Kim are a young couple from Australia. Danny is wearing a smart wool jacket he had tailor-made for dirt cheap in Hoi An and Kim says she had some great dresses made there as well. They just came from Cambodia and loved Siem Reap. Sathris and Leholm are two guys from Singapore. The Vietnamese father escaped on a boat from Vietnam in 1983, when he was 49 years old. He slaved in a Viet Cong labor camp and then was out to sea in this boat for 11 days with no food or water. Luckily a British tanker picked up the passengers and took them to Hong Kong. 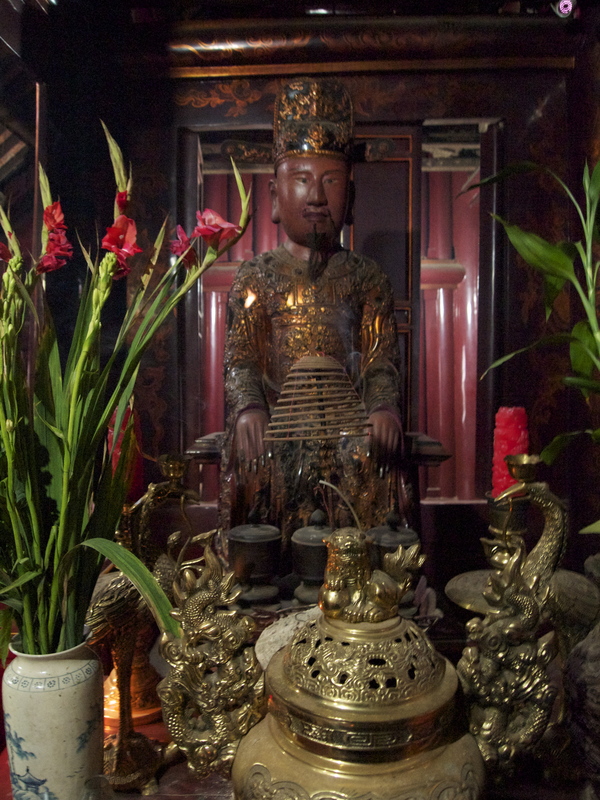 He eventually was able to join his family in Toronto; his wife had already left Vietnam years before. His daughter and her Chinese husband escaped on a fishing boat when they were 20 and 23 years old, with two small children in tow. They spent 4 days on a boat that eventually ended up in Thailand. The whole family, now coming back to Vietnam for the first time since their escape all those decades ago, is happy that they left here. They now have a nice life in Canada. I am captivated by their stories, similar to Andrew X. Pham’s stories in Catfish and Mandala, one of the books I read before I came here. 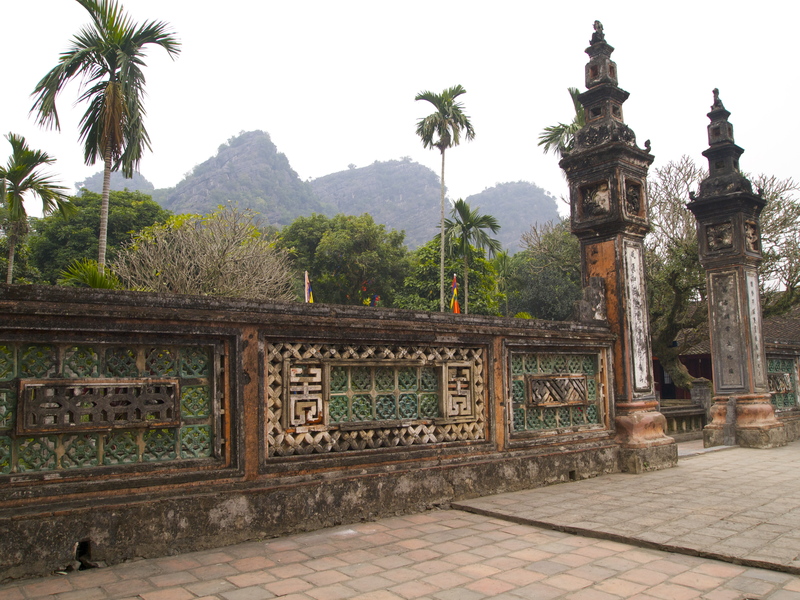 Adam tells us that Hoa Lu, in Ninh Binh province, was the first capital of Vietnam. His English is bad so I don’t know half of what he’s talking about. He keeps referring to two-digit numbers like twelve o’clock as one-two o’clock. 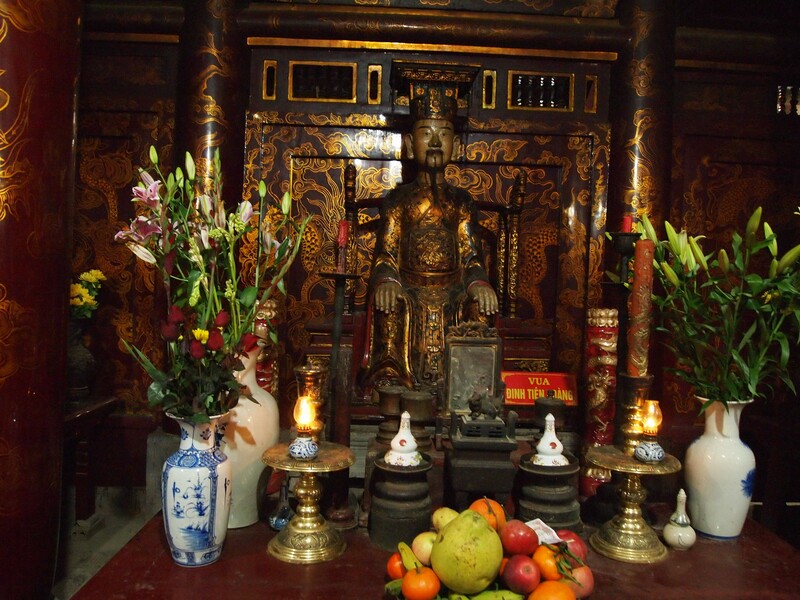 He tells us we will see the Ling Lai Temple at Hoa Lu and then we will have lunch at one-two o’clock. 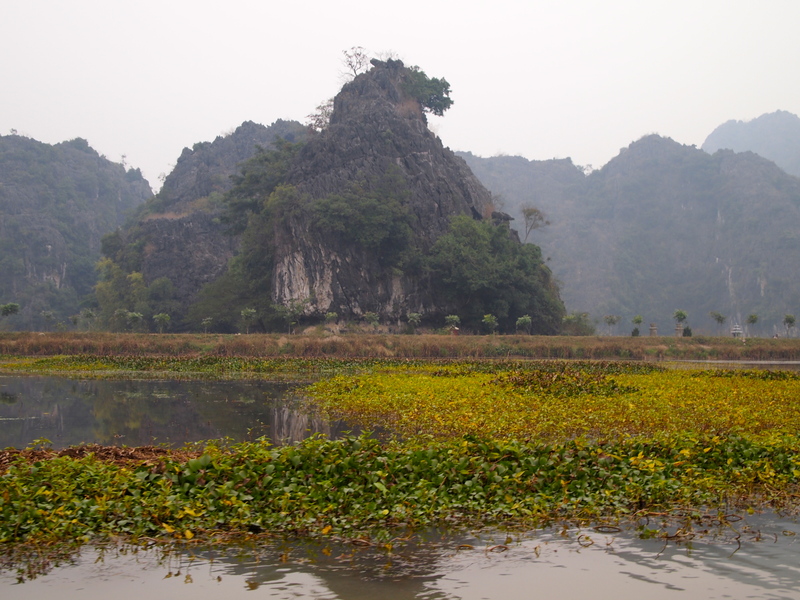 After lunch we will spend two hours on a small boat at Tam Coc, where we can see scattered tombs at the tops of the mountains. We stop at another “happy room” on the long trip south; there I buy a Thailand plum, a cross between a pear and an apple, but not as sweet. Back in the van, as I munch happily on this fruit, we fly past a biker pedaling along loaded down with big flat cone baskets full of limes and tangerines. It’s a long drive in a van with no seatbelts on bumpy potholed roads. The driving style is the same; on two lane roads, people drive at an excruciatingly slow pace, passing bikes, motorbikes, buses or trucks regularly despite the traffic being heavy in both directions. At the last minute, these passing vehicles manage to slide back into their proper lane before a collision occurs. In between chatting with people, this is what I see out the windows: a gas station called Petrolimex; concrete open-air cubbyhole businesses, doorless garages with corrugated tin roofs. Rusted chain link fences, piles of dirt, piles of gravel, refuse everywhere. Palm-like tropical plants fuzzy with dust. Two- or three-story thin rectangular concrete houses with fancy balconies, chipping paint in Mediterranean colors, some with red tile roofs. Again, no paint on the sides, just windowless gray concrete. A few exceptional houses painted nicely with plants on the balconies. Huge gravel lots dotted with grotesquely shaped rock sculptures. Honda, Yamaha, Suzuki, Symauto. Sidewalk barbers giving shaves and haircuts. The Bank for Investment and Development of Vietnam. Government buildings in faded banana yellow with brown trim, palm trees in front. Another park with more huge Rorschach-blot rocks. Motorbikers bundled up in knit caps, helmets, bubble jackets, slippers with fuzzy socks, masks. Old buildings in various unfinished states of construction, much like the ubiquitous apartment buildings I saw in Egypt. Not new, these unfinished projects sprout plants and weeds and vines on walls and floors; I can’t help wonder why the projects died before they ever got off the ground. 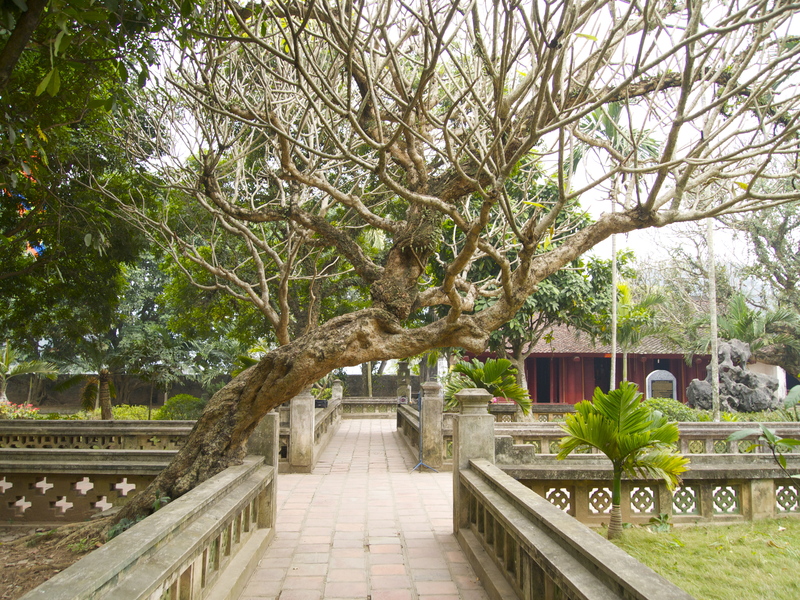 Cemeteries filled with hundreds of miniature pagodas. 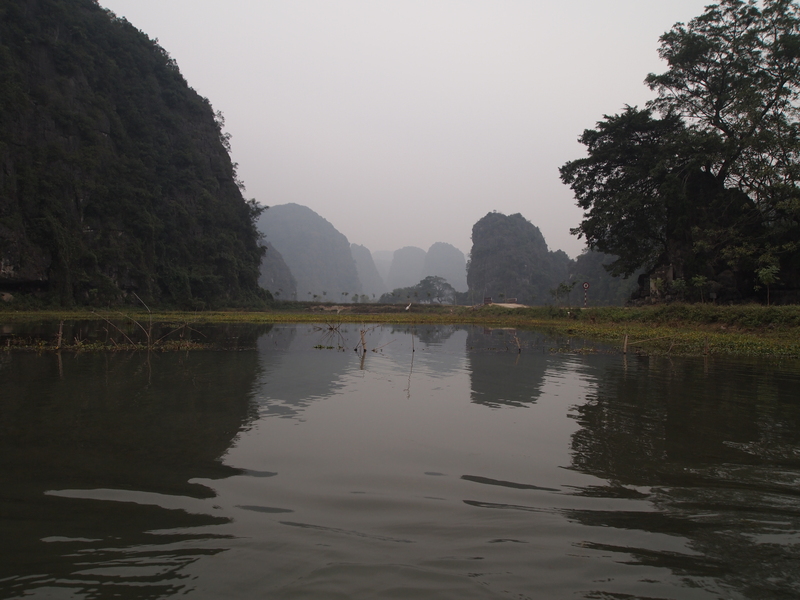 The ever-present gray haze here with us even 50 km south of Hanoi. 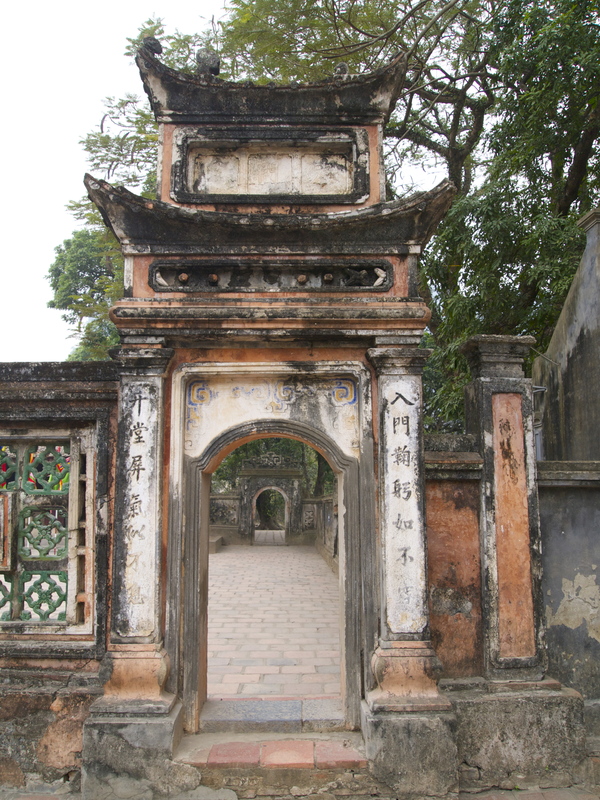 The truly nice and beautiful places around Hanoi are just specks in the overall landscape of rubbish and decrepitude. 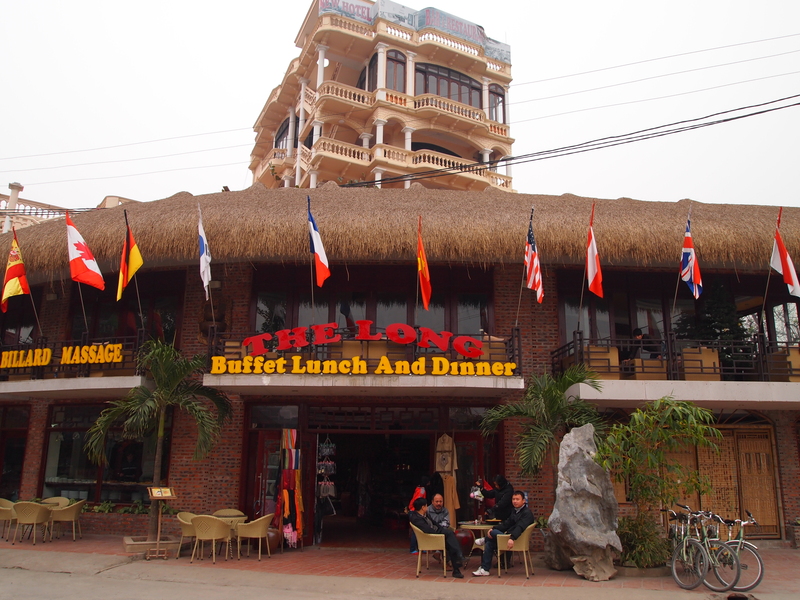 This is more apparent on this drive south than on the eastward drive to and from Halong Bay on Saturday and Sunday. In front of houses along the road, square or rectangular fish ponds are hemmed in by scrubby palm trees or refuse. 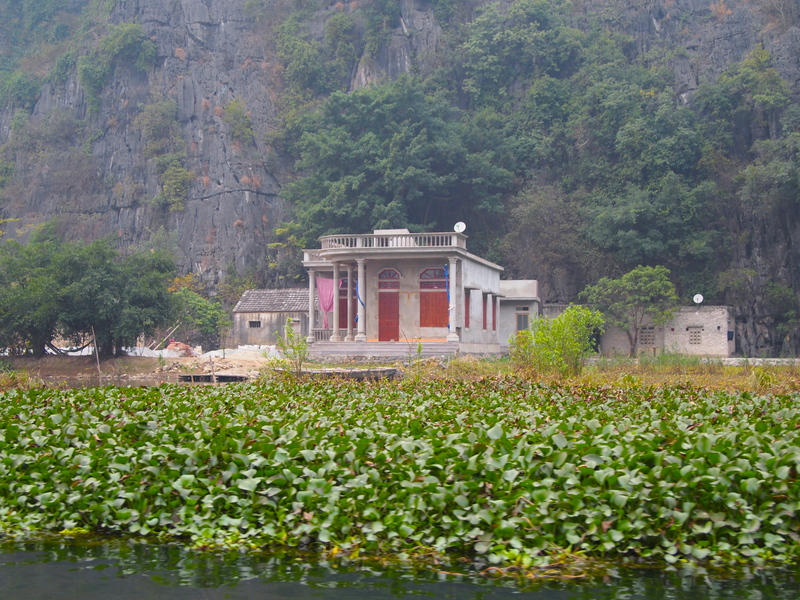 One of the Vietnamese guys explains that these ponds are filled with sunfish, meals for the local families. Rubbish, rubbish everywhere. Dust, haze, smog, gray skies. It’s dreary and cold. It’s a bit depressing today. 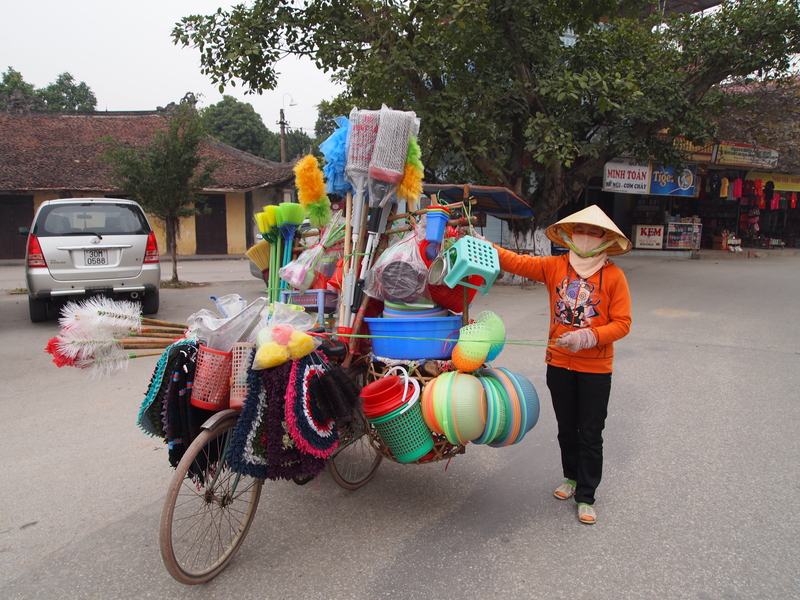 There is no attempt made by the Vietnamese to hide their piles of rubbish. Piles of gravel, bricks, tires ~ the discarded building blocks of society in useless array. Around the sculpture businesses, chips of stone are left where they fall, littering the ground. I keep thinking that the rubbish collection business could make a killing here if the proper laws were passed and enforced, and public dollars went towards creating a rubbish collection infrastructure. My question about the rubbish is this: is it just poverty, naturally sloppy Vietnamese, or poor government planning ~ no infrastructure? I think the garbage problem is worse than what I saw in Cairo. I mention my thoughts on this to Colin and Tracy from Manchester, who just came from a month in India. Colin says in India I will see ten times the rubbish I see here. They say there are rules that you can’t smoke in certain parts of India, but it’s okay to pee or defecate anywhere. I ask them what was their favorite thing about India, and Colin says, “The flight out.” They say a trip to India is “a trip you endure, not enjoy.” Funny how their experience was the antithesis of Ryan and Thea’s trip. Australians Danny and Kim say Phnom Penh is worse than Hanoi by far ~ impoverished, filled with rubbish, and not much there. But they loved Siem Reap. Later, when I get to Phnom Penh, I don’t see this at all; to me Phnom Penh is nicer than Hanoi; I find lots of interesting things there. It’s so funny how each person’s experience of a place can be so different, how one’s experience can be colored by interactions with people, weather, where exactly one is in the place, whether transport goes smoothly. So many factors. Two people can have totally opposite experiences of a place, one loving it and the other hating it. This is how I feel in Korea; while so many native English teachers love their experience, I dislike it altogether. 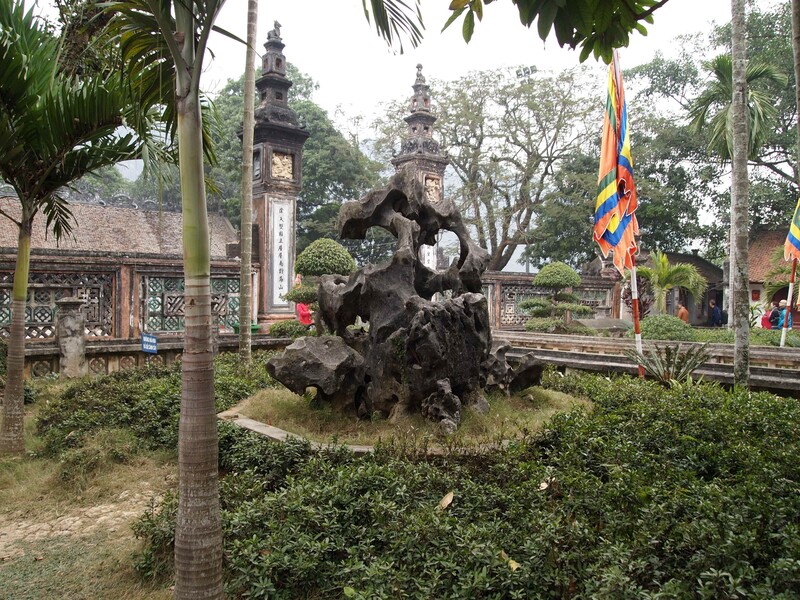 Finally, after an interminable drive through the dilapidated outskirts of Hanoi, we arrive at Hoa Lu, the political, economic and cultural center of 10th century Vietnam. It was also the native land of three royal dynasties. 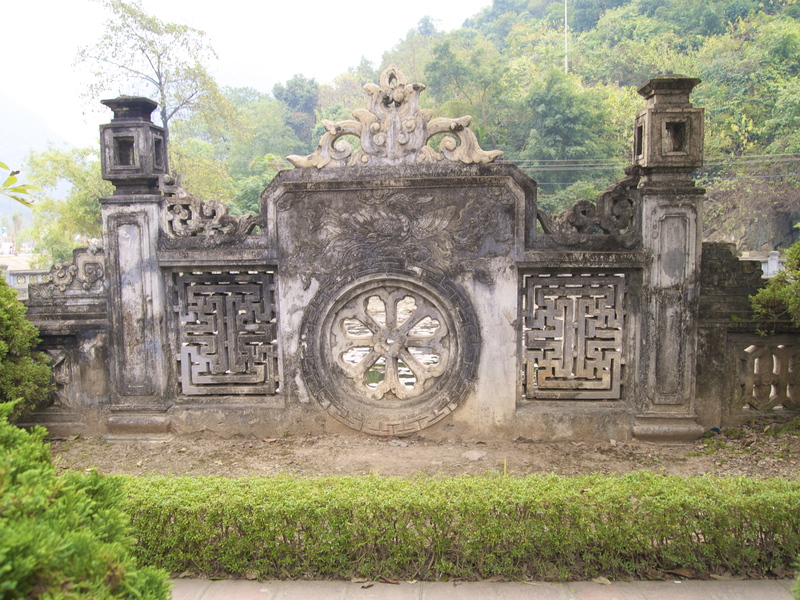 Today, the ancient Citadel exists no more, and all that’s left are some remainders of the dynasties. I find the entire complex quite shabby. No matter how we humans try, everything we create disintegrates around us. While we’re there at Hoa Lu, we run into another tour group, and in their midst, surprise, are Roz and Sway and the Korean woman from my first day Hanoi City tour. We are surprised to see each other again and spread hugs all around. I don’t know who this guy is… doesn’t look like Buddha. Possibly Confucius? When we leave the complex, locals descend on us from every direction and try to sell us bananas or water or postcards. I feel stingy sometimes not throwing my money at every person trying to sell me something, but I can’t save the world and I can’t afford to be too generous. I believe in buying goods made locally, but I must limit myself to buying only things that speak to me, things that I find aesthetically pleasing. I cannot afford sympathy buys. 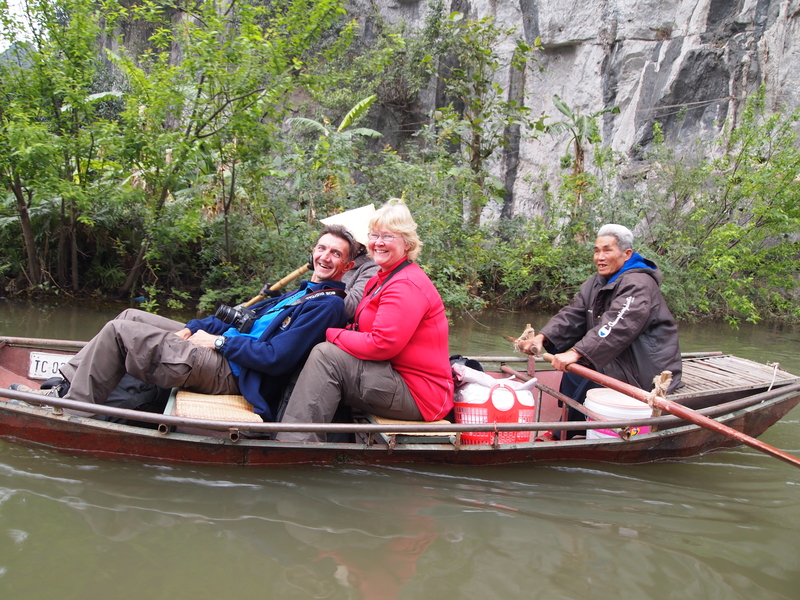 One old lady carrying bunches of bananas attaches herself to Adam, our guide, and won’t leave him alone until he buys a bunch from her. She’s relentless; she must have given him the fellow-Vietnamese guilt trip. Later, on the van ride home, he gives us the bananas for snacks. 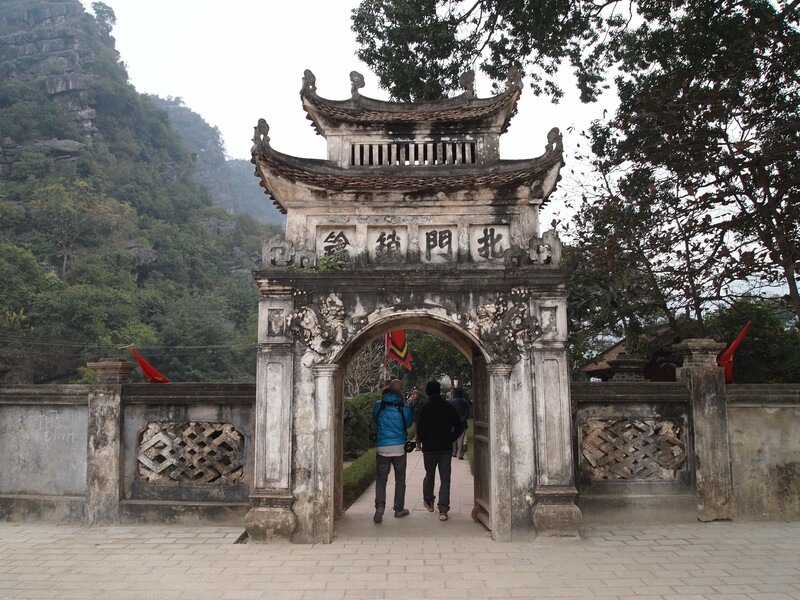 While I’m at Hoa Lu, I start getting messages on my camera: CARD FULL! I keep erasing old pictures, but for every 5 or so I erase, I can only take one more picture. Finally, one of the guys from Singapore looks at my camera and tells me my pictures are set on RAW, instead of jpeg, meaning they are HUGE files. I don’t know how this happened, but he corrects the setting. However, many of the pictures I’ve already taken on this trip are now RAW, and I cannot delete them. They are taking up the card space. It appears I might have to buy a new card on this trip. 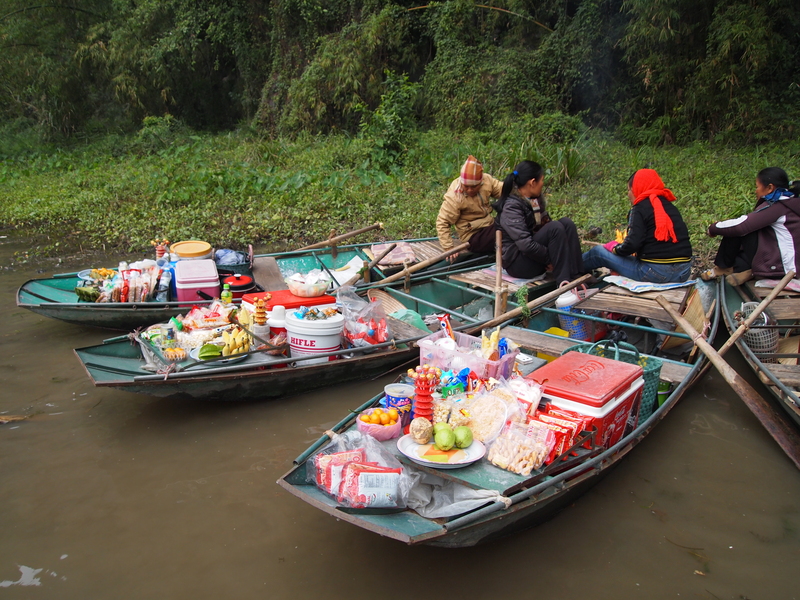 When we get to the lunch destination, near Tam Coc, I am hustled away to a table all alone, away from the rest of the group. I protest that I came on a tour and I want to sit with the others. But, they insist: you paid for the VIP tour. You get a table all to yourself! I say, I never paid for any VIP tour. I just want to sit with the group. The group is eating a buffet dinner, while I am to eat from the menu. That doesn’t sound like VIP to me, it sounds like RIP-OFF!! I tell them I refuse to sit where they want me to sit, that I WILL sit with the others. They don’t know what to do with me, but it apparently causes great consternation among the staff who insists that it’s a problem for the “menu” people to sit at the same table with the “buffet” people, because how do they monitor us to keep us from helping ourselves to seconds and thirds from the buffet menu? I find all of this utterly ridiculous and just plop myself down in the midst of the others. 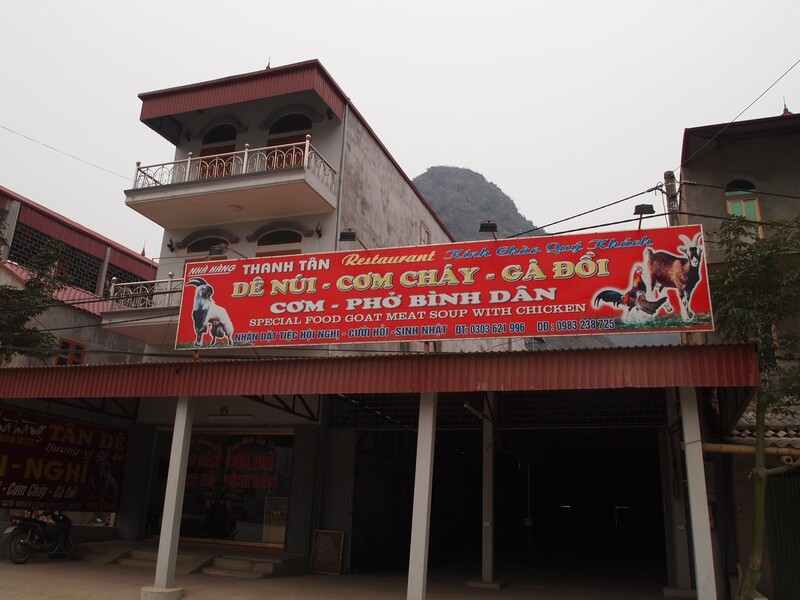 The “menu” meal is bland and cold, hands down the worst meal I have eaten in Vietnam. The “buffet” people say the exact same about their meal. So, what’s the difference? 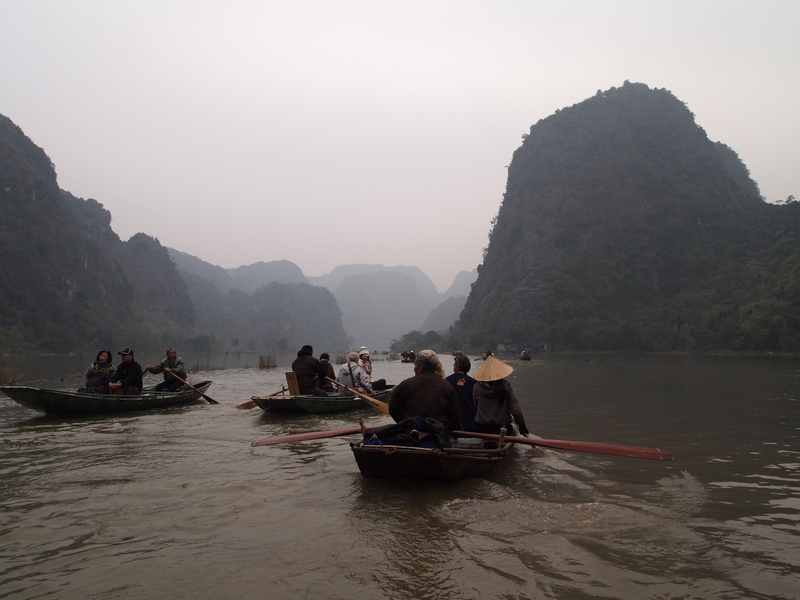 We then head out to the metal rowboats, not as charming as the bamboo boats on Halong Bay. 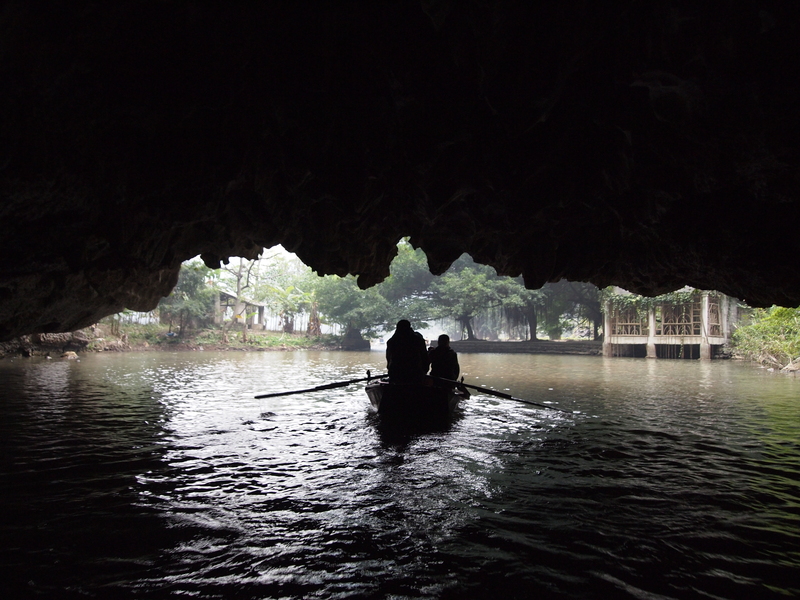 Tam Coc, which means “three caves,” is a 2-hour boat excursion down the Ngo Dong River through rice fields, limestone karst towers, and 3 caves. My partner in the boat is the Portuguese guy Joao, since we’re the only two not paired up. On the boat ride, Joao keeps talking about the “visitation” in Portugal, and I say, What? Like the Virgin Mary? After much going around and around, I finally figure out he’s talking about the “vegetation” in Portugal. Joao keeps hacking away and has been doing so the whole way down from Hanoi. When I express concern about his health, he says he’s sick from going from warm Ho Chi Minh City to cold Hanoi. I know what he means because I have felt sick all day, chilled, sore throat, nasal stuffiness and post-nasal drip. Yuck. 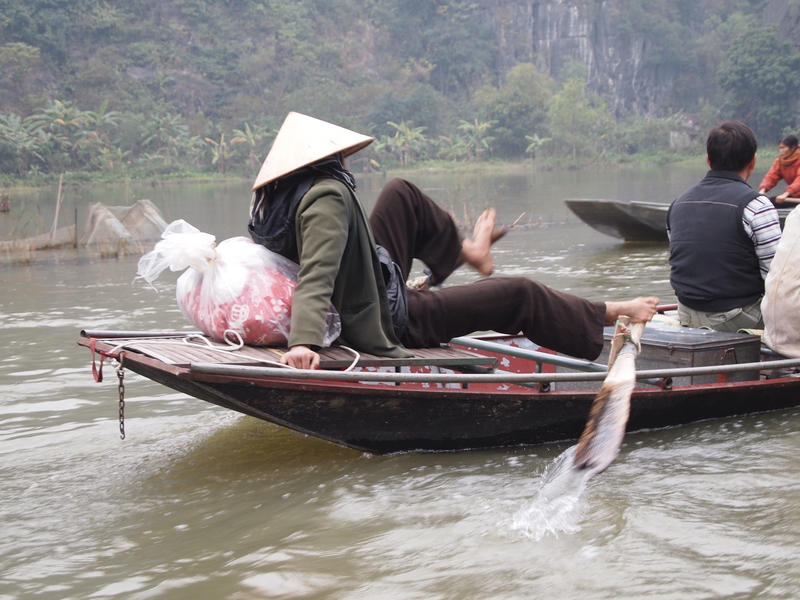 The boat paddlers are Vietnamese of all variety, some young women with conical hats, some toothless old men. Some paddle with their feet, all playful, laughing and joking among themselves, across the expanse of water. 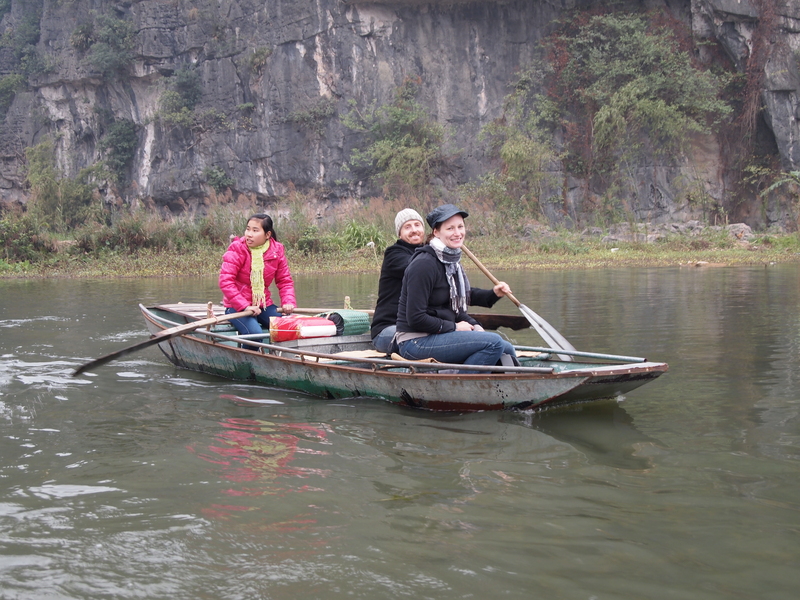 We float along marveling at the sheer karsts; I keep looking for rice paddies. 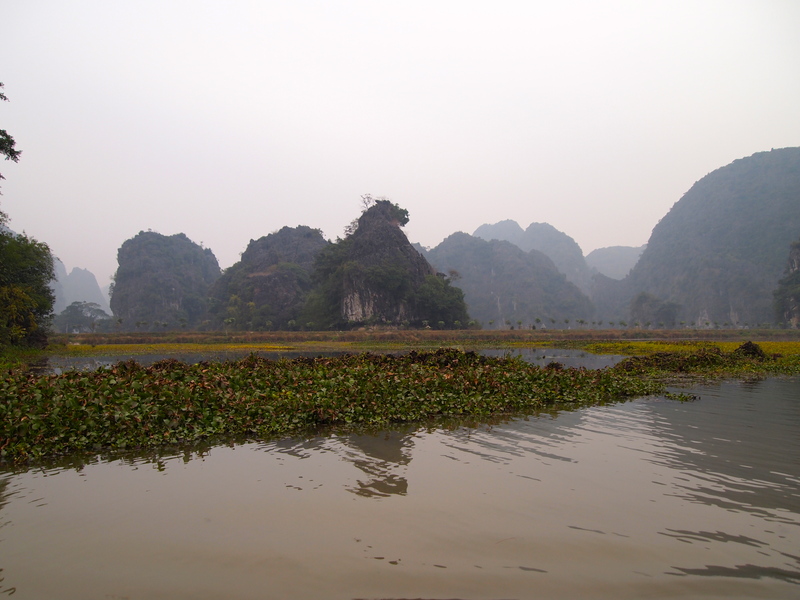 This place is touted as the “Halong Bay of the rice paddies,” but I don’t see any at all. Maybe it’s because it’s winter and the rice has all been harvested? Since I’m expecting to see these and don’t, I have to say I’m disappointed. 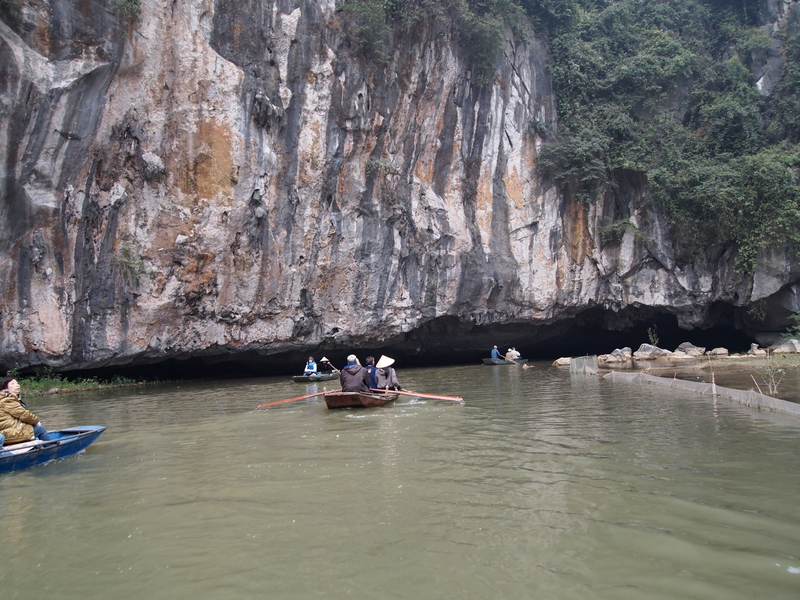 We go through the 3 caves with their low ceilings, ducking to avoid getting clocked by the granite ceilings. 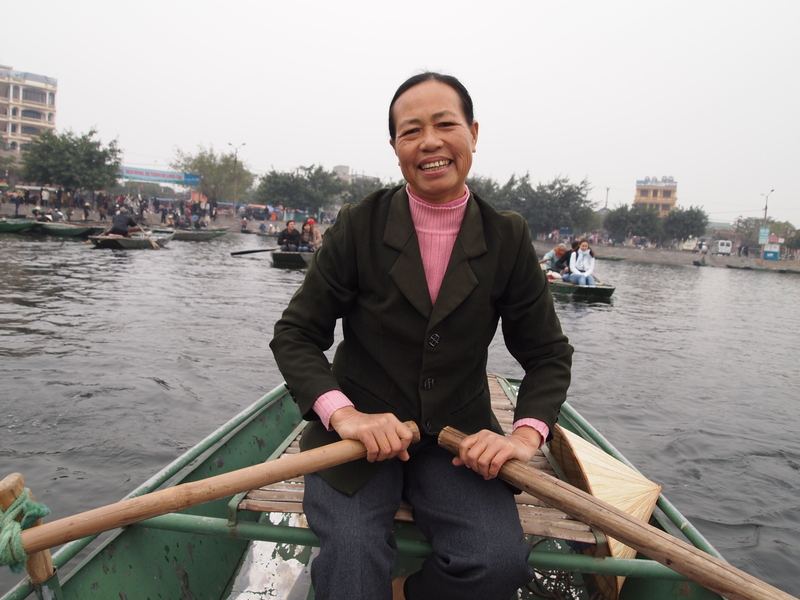 Our boat lady paddles us into a floating market, a virtual Vietnamese 7-11, and as we go into the midst of the boats, they surround us. In their straw cone hats, they fling their sales pitches at us. We are at the furthest point out and trapped. One lady offers hot coffee and as I’ve been cold all day, I take her up on it. She hands me a small dirty glass with her brown stained hands. I drink it, unsanitary though I think it is, just to feel warmth for a few short seconds. In the meantime, she holds out a coke and some crackers and motions that I should buy them for my boat lady. Portuguese Joao remains stone-faced the whole time, acting as if he is totally removed from the scene. 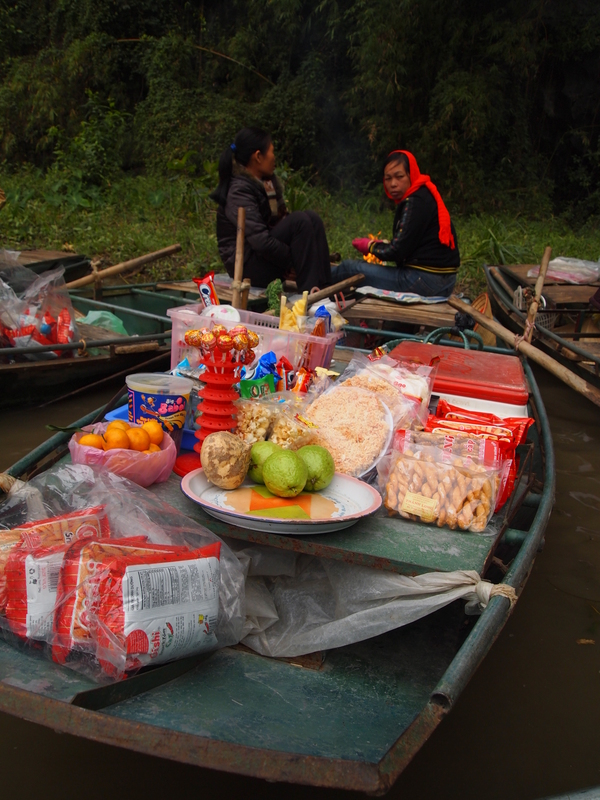 Later, when we escape the floating 7-11, the boat lady paddles out into the middle of the river and opens a big chest in the boat and starts displaying embroidered linens. I say no, no, no, but she keeps bringing out item after item. I just want to get back so I can be warm. I say “No!” adamantly, and then make paddling motions, urging her to take us back to the start point. During all of this the Portuguese is in a world of his own, saying absolutely nothing. Nothing at all to contribute to the situation. At the end, when we get to the shore, she says: Madame, Monsieur, tip?? I give her 20,000 dong ($1), expecting the Portuguese to give her another $1, but he gives her absolutely nothing, just totally ignores her. I don’t know what his problem is, but it really irks me, this totally superior, standoffish, attitude. Finally, we are on our way back to Hanoi in the van. A repeat of the drive down, more of the same. Late in this afternoon, it is gray and even colder than earlier, so I ask the guide and driver if they can please turn on the heat. They tell me the van has no heat. I have been quietly freezing for 1 1/2 hours. Finally, I’ve spoken up, and still I will be cold. Overall, it is a miserable day. 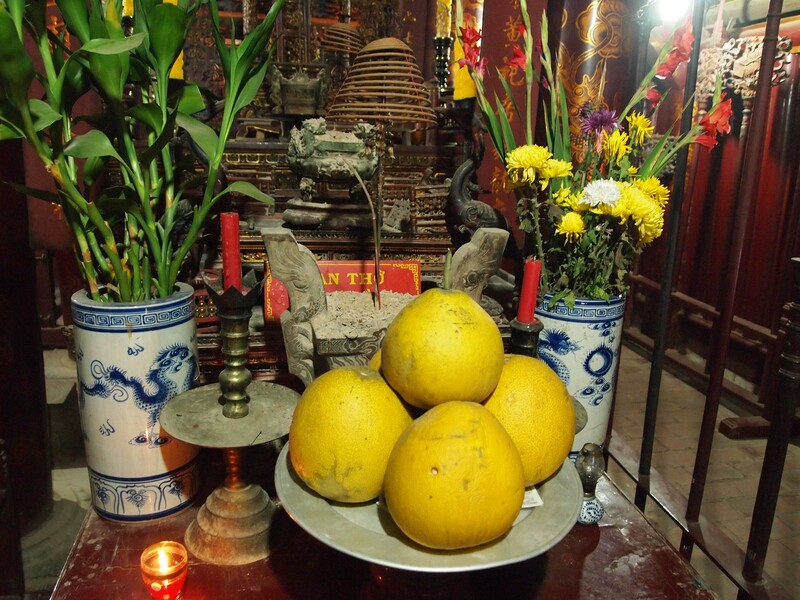 I would definitely NOT recommend this tour and I wish I had just stayed the day in Hanoi, exploring the city. 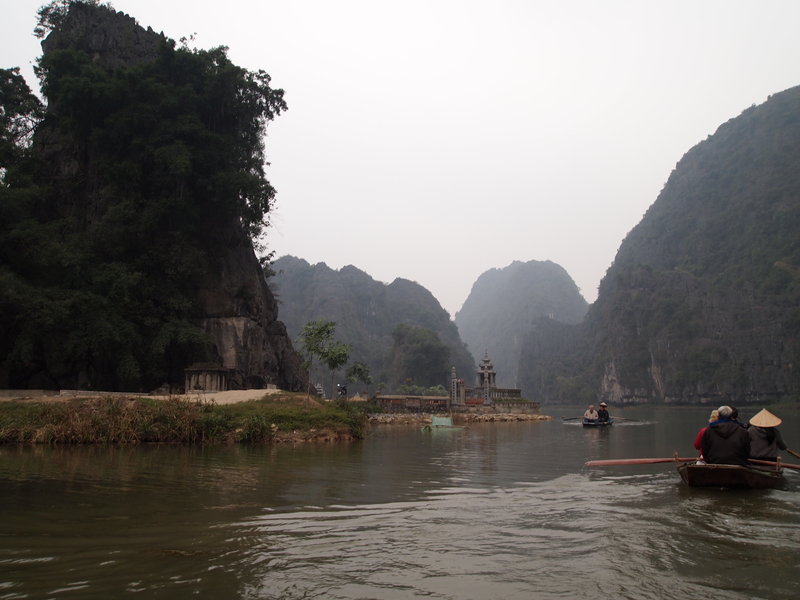 floating along the gray river at tam coc… where are the rice paddies? Traveling abroad takes me out of my comfort zone and throws me into an alien world. Sometimes this world is comfortable, relaxing, beautiful, serene. Sometimes it’s a hardship, ugly, dirty, cacophonous. I often feel dislocated, a little off kilter, because nothing is familiar. Most times I like this; I feel my senses are heightened, I’m more present to the moment, I notice things I wouldn’t notice at home. Other times, it can be drudgery. But ultimately, I’m awake, I’m alive! I think about my time in Cairo in 2007. Egypt was a hardship. In July, it was miserably hot, and being covered in long pants and long sleeves didn’t help. Infrastructure was poor, the city was awash in dust and filth, the electricity was unreliable and sporadic, unexpectedly going off for hours at a time, several times a week. Once a week at least, we had no hot water. Internet service was slow and would cut off in the midst of a session. Public transport and taxis were ancient and lacked air-conditioning. Yet. I felt more alive there than I had felt in a long time. 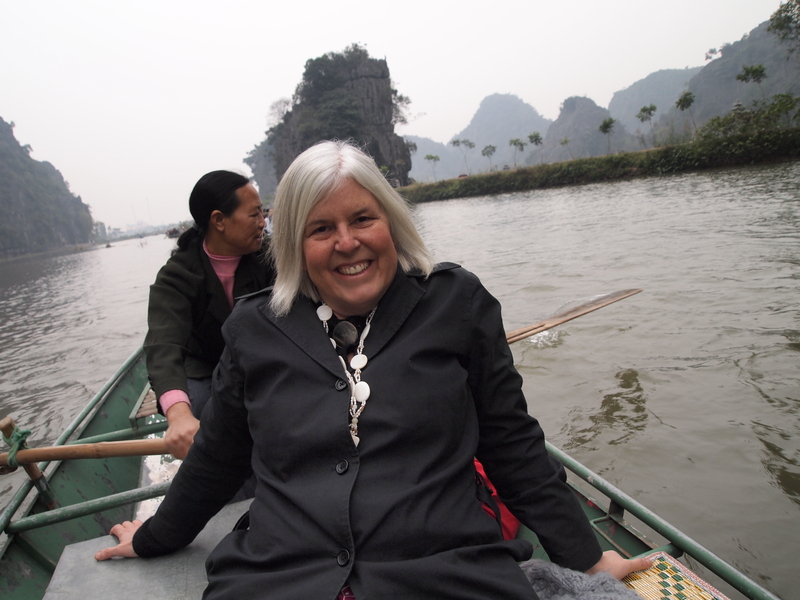 This is what I love about travel, that sharpened awareness, that immersion in cultures and different worlds. It takes me out of my comfort zone, but it mesmerizes, it seduces, it jolts. 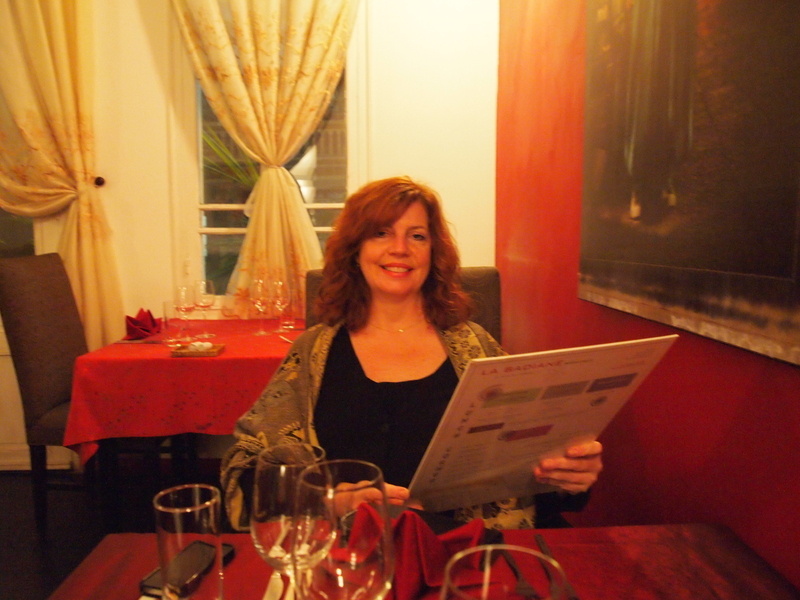 Finally, in the evening, I meet Ruth at her hotel and we go to a French restaurant, La Badiane, that Ryan and Thea recommended. Ruth had to work today, but she also found time to go out and buy a warmer coat. I am still cold. 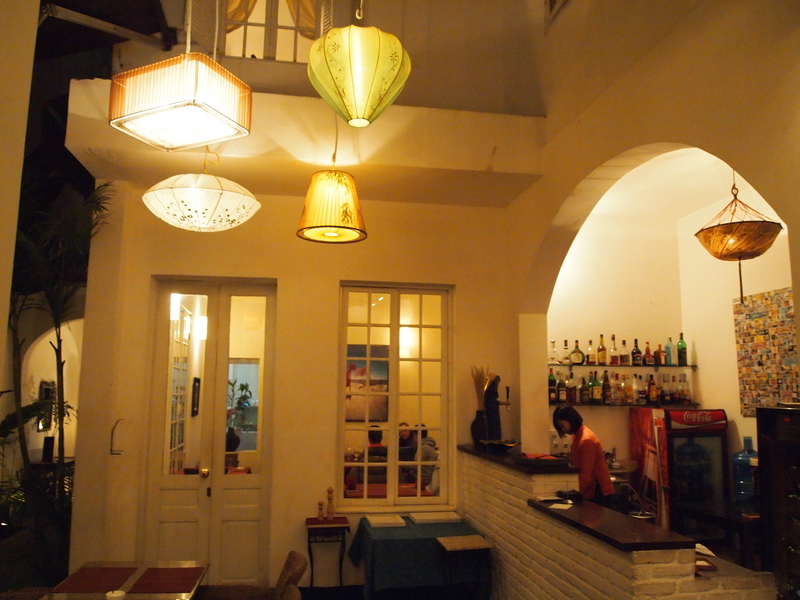 We order a bottle of red wine and the whole set menu, with appetizers, main dish, & dessert. 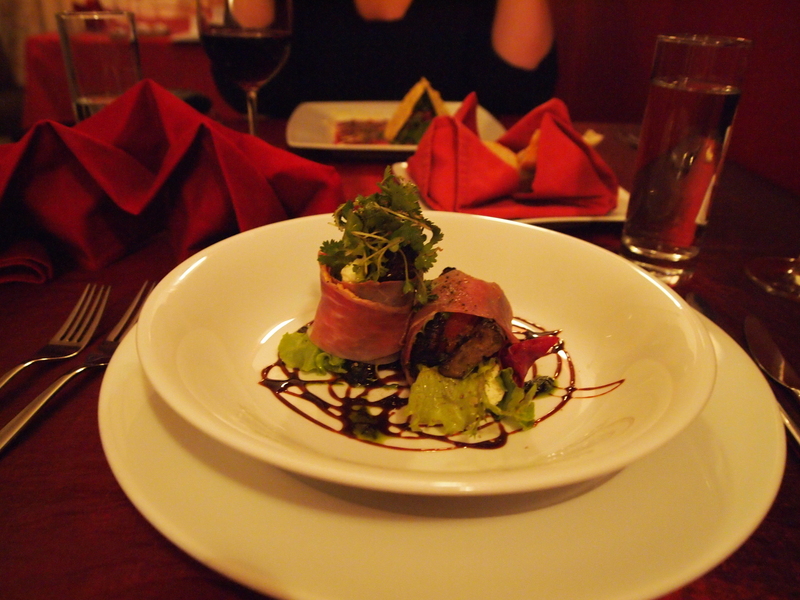 The food is masterfully and artistically prepared. Sadly, my memory is like a sieve and as I was enjoying myself too much to write down what I ate, I have forgotten. But I swear it was delicious!! We had an amazing time laughing and sharing our stories. Thanks to Ruth, my day was saved! 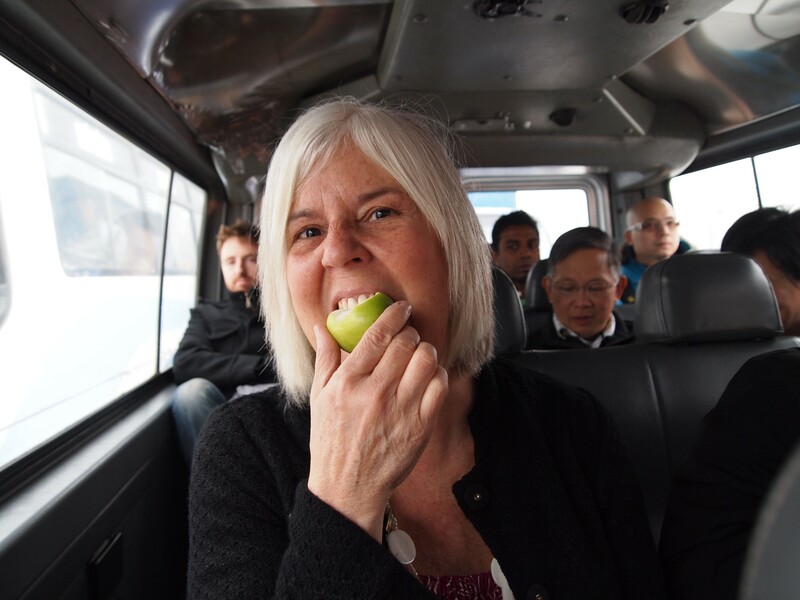 As we’re taking our taxi back to the hotel, Ruth sees an Apple store and she needs something for her iPhone. Next door, I see a camera store, so I run in to buy a new card for my camera. I buy an 8MB card for about $25, but strangely, it comes in just a plastic case, with no cardboard packaging. It isn’t sealed. At the time, I don’t think much of it, but later, as you will see, this comes back to haunt me. Ah, the perils of traveling and doing business in a foreign land.